LAUNCESTON, 10 January 2018. If you fancy folk, fiddle or poetry, you’d find yourself with very good company at the 2018 edition of the Tamar Valley Folk Festival. This cultural and musical fiesta brings largely Australian and a few international artistes together over three days by the scenic river in northern Tasmania. Mark your calendar with a few of the musical and artistic acts lined up (see some highlights of the programme below) at venues spotted around within the historical George Town where the Tamar River flows through. The festival has come a long way since 1992 – yes it has been going on for more than 20 years – to bring you themed concerts, intimate solo performances, children's activities, poetry readings, dance, and more in a small town setting. You’re bound to enjoy street music too alongside town folks. And bring a mat for a picnic at the park where there’ll be free airing of bluesy and folksy tunes. Proudly Tasmanian, the Tamar Valley Folk Festival also celebrates the unique sounds rendered by recognised musicians who were either born or bred, or both, in Tasmania. This would include performers such as Alex Myers, Malcolm Turnbull, John Lavery, Tony Newport, Daniel Townsend, Kerry McGuire and members of Seagrass such as Tim Saunders (banjo, guitar, vocals), Rowlie Walker (mandolin, vocals), Mark Phillips (bass, vocals). Seagrass combines blues with bluegrass acoustics. So how about getting a slice of Australian culture at this festival? We’ve highlighted a few artistes below while you can check out of the rest of the performers on the website. Ticketing information on both weekend or single day tickets can be found here. Kym Pitman is a soulful poet and songwriter with a haunting voice. Kym's songs are deeply entwined with the spirit of the country. Kym has enchanted festival audiences across Australia and beyond. 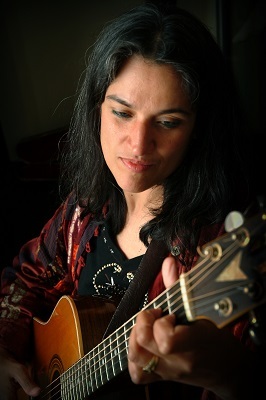 Her songs have received awards from The Australasian Song Writing Association, North Coast Industry Awards, and from the Eco-Arts awards (USA). Kym blends a unique contemporary folk-roots sound with intimacy of landscape, spirit and story. Luke Robinson - A solo song singer-songwriter, originally from Gippsland, Victoria, who, after a decade of working around Australia as a doctor, has now settled back in Melbourne. With a rich powerful bass voice accompanied by acoustic guitar and crafted lyrics Luke's songs range across topics diverse as our nation's relationship with its First People, refugees, fracking, war, vagaries of Australian politics with some light hearted commentary on modern life. Joe Lynch - the ‘Authentic Irish Storyteller, singer and Poet’, born in the mountains of Cork, an area steeped in the ancient art of storytelling. Joe's stories and poems are deeply romantic, thought provoking and often hilarious. You'll laugh, cry and feel like never before. Suzzette Herft - Suzette is a soulful songwriter who shines with a natural grace and presence. Suzette has won wide acclaim for her brilliant tribute show to her hero - Joan Baez for being the voice of the ' voice of the voiceless' at numerous festivals around Australia. She is a masterful facilitator of singing sessions and a' song catcher' with her wide ranging repertoire and her passion for inclusivity and 'giving everyone a voice'. Danny Widdicombe - Danny is part virtuoso guitarist, musical director, songwriter, singer and story teller. Based in Brisbane, Queensland and best known for his folk-country-blues stylings but he's also heavily influended by jazz, indian, bossa nova, classical and anything in his meticulously documented record collection. Danny has released three albums as a solo artist, three more with The Wilson Pickers and appeared on a myriad of albums playing as a session musician. Luke Moller - Fiddle and mandolin player Luke , originally from Brisbane is now based in Nashville, TN. Toured with Carrie Underwood, Lana Del Ray, Jon Pardi, The BoDeans, Cracker, Maddie & Tae, Eric Paslay and Delta Goodrem. 3 pm - Welcome Afternoon Tea in the Supper, Room near our office, Memorial Hall. Join the George Town Soroptomists for a delicious and reasonably priced afternoon tea. Story Teller, Irish Joe Lynch will entertain at the afternoon tea from 3.30 Pm. 10 am - noon - A Display of Hand made musical instruments by Local Craftsman, David Herring will be featured near our office at Memoria Hall. See David's Therapy, lap and little Harps and meet the maker. 11:45 am - Meet the Poet. Irish Joe Lynch at Yacht Club (Code 6 on your map). Enjoy an informal workshop for poets where Irish Joe will chat about his work and help and encourage others to write and recite. Bring a note pad and feel free to bring your poems. Door Sales $15. 2:30 pm - Songwriters Concert - Songs of Conscience and Country Featuring Kym Pitman, Luke Robinson, Teri Young and Suzette Herft. Join these acclaimed Singer- Songwriters as they share their work on the subject of Country and conscience. Door Sales $25 without weekend or day ticket. 7 pm - Saturday Evening Concert at York Cove Centre - Sorell St. (key code 5 on map). Teri Young and The Restless. Malcolm Turnbull and John Lavery. Daniel Townsend. La Busca. Kerry Maguire. Matt Gibson. Door Sales $25. Tea and coffee available- gold coin donation. 9 am - Poet's Breakfast - Memorial Hall (Supper Room). Irish Joe Lynch , our Festival Poet 2018 will host the breakfast. Come along and present your poem or dine in and enjoy the poetry.